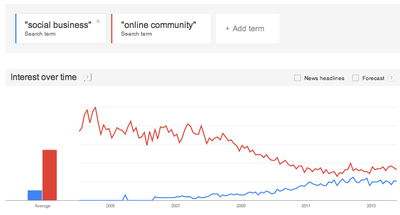 Contrary to common perception, the popularity of online communities has declined. It peaked in April 2004. This is partially attributable to the rise of social media. 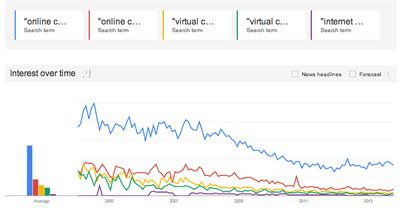 As social media grew, the popularity of online communities dropped…at least a little. Companies that might've created communities are, for better or worse, now building Facebook and Twitter accounts. However, interest in communities has stablized. This is important. And it has important implications. First, communities aren't the future of everything. Yet nor will they die out. Like customer service (see Zappos), there will be some organizations which base their entire strategy around their community (Dell, Autodesk etc…). There will be many more that use it as a particular tool for a specific purpose. Second, communities are boring. This is a good thing. As Clay Shirkey wrote; “Communications tools don't get socially interesting until they get technologically boring" We're over the hype plateau now. Communities are an available tool to achieve specific, measurable, goals. Organizations will need community professionals to use this tool. Third, the continuing rise of social media isn't a threat to communities, not anymore. Both have found their place. Social business has also found its place too. If you're working in communities, the stablization of interest is a good thing. It means we're beyond the hype. We can focus on applying real, proven, scientific processes to achieve real results. Don't fixate on the hype.